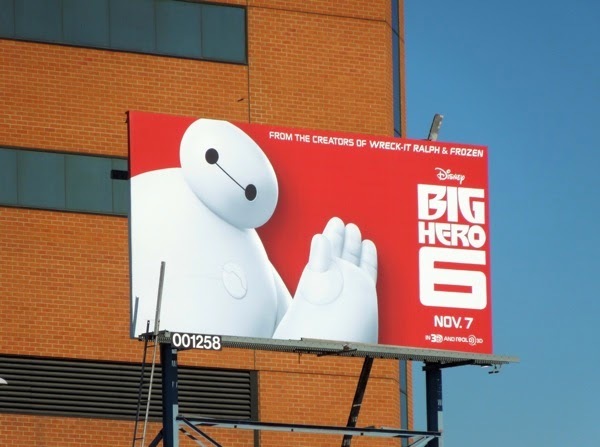 Say hello to 'Baymax', one of the lovable characters from Disney's new animated feature, Big Hero 6. 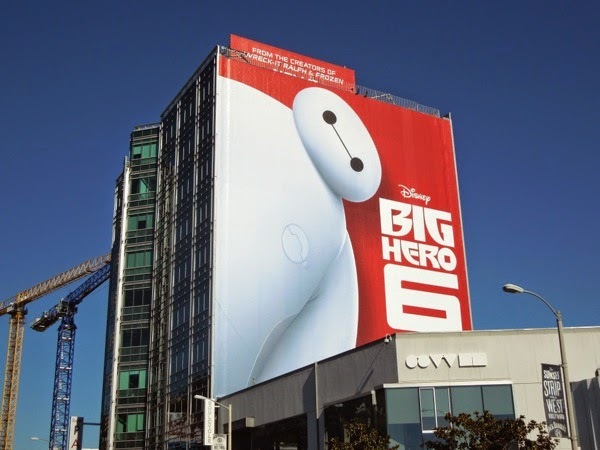 This white marshmallow looking creature is actually a robot nurse based on the character of the same name from Marvel Comics Japanese superhero team, Big Hero 6. 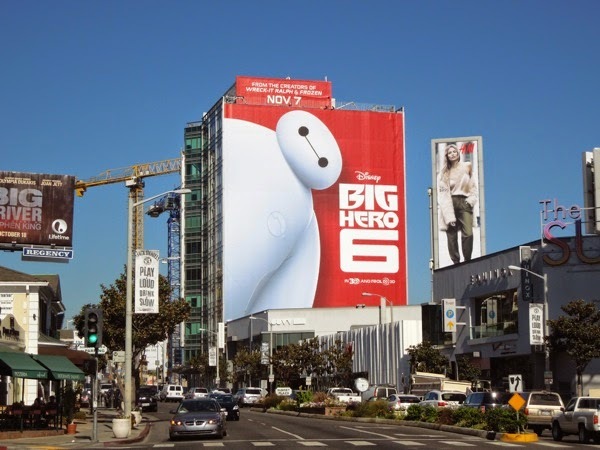 In the Disney animated movie the inflatable healthcare companion is transformed into the crime-fighting warrior Baymax by his child genius charge, 'Hiro Hamada', who along with his friends 'Honey Lemon', 'Wasabi', 'Fred' and 'GoGo Tomago' team up to protect the fictional high-tech city of 'San Fransokyo'. This is the first time any Marvel characters have been given the big screen animation treatment since the company was bought by Disney in 2009, and as this was a bunch of Z-List heroes created in the late 90's without any major history in the scheme of things in the Marvel universe and who have only appeared in two limited series and a few guest-starring roles, there's lots of scope to be creative beyond the initial premise, and that's probably why this is branded a Disney movie rather than a Marvel film. 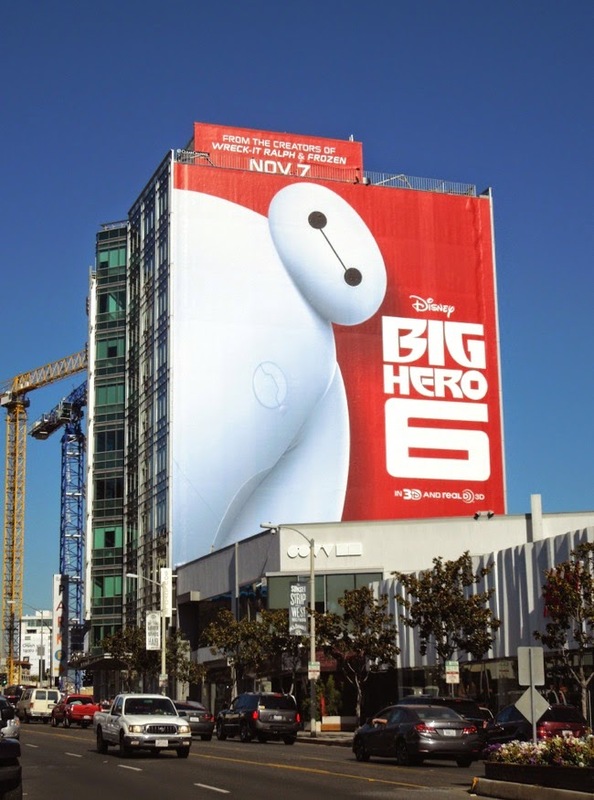 The Walt Disney Animation Studios seem to be on a roll of late with box office winners like Tangled, Wreck-It Ralph and Frozen, so let's hope these little-known characters have the same magic to light up the big screen. 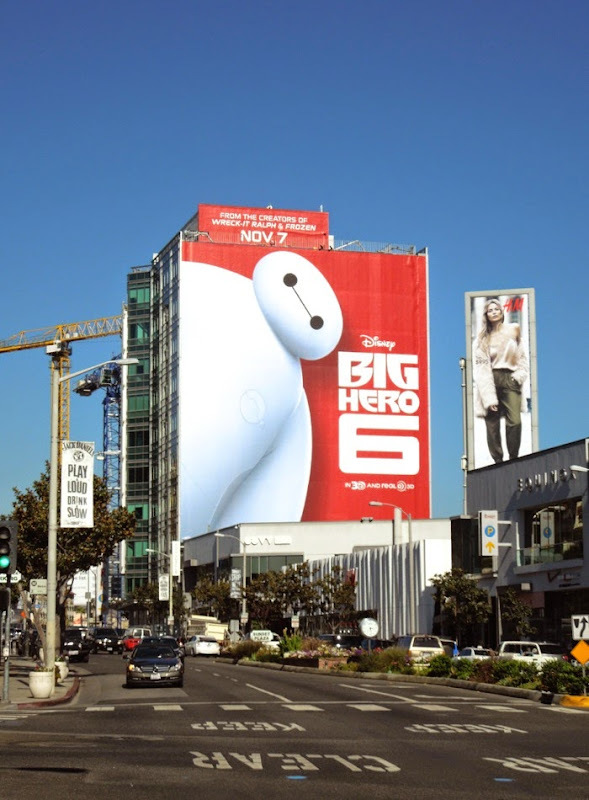 This bold giant-sized billboard which looks like the big dope is going peekaboo was snapped along West Hollywood's busy (and changing) Sunset Strip on October 2, whilst the smaller portrait billboard was spied high above Vine Street in Hollywood on October 6, 2014. 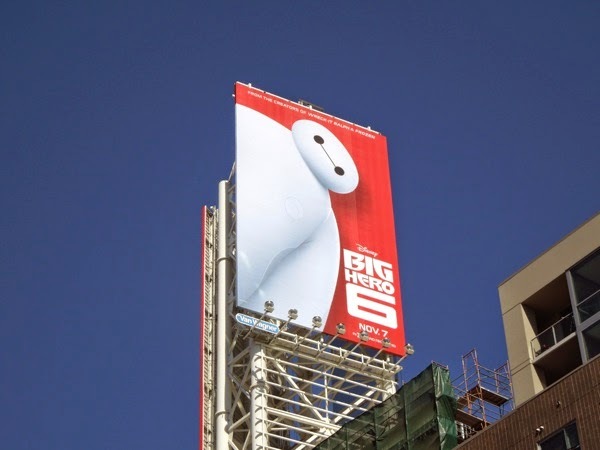 The only problem is, this super-sized ad creative would have had even more impact if it hadn't followed this equally striking, red How to Get Away with Murder series premiere billboard. 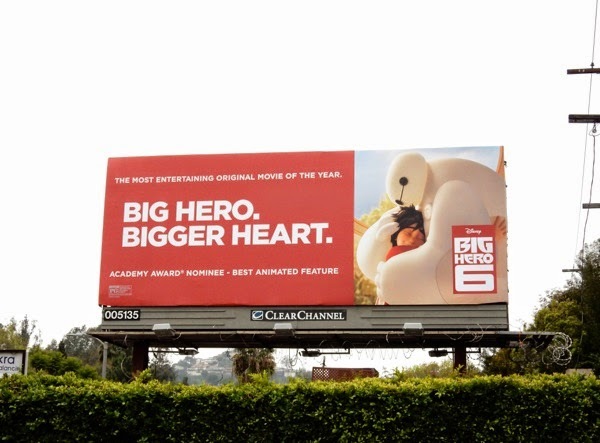 Regardless this looks like a fun film, with big heart as well as big heroes, in the grand Disney (and Marvel) tradition. UPDATED: Baymax is fast becoming the breakout star of Big Hero 6 if the trailers and TV spots are anything to go by, and these new special extension billboards popping up around L.A. featuring the cute character giving passersby a wave are a whole lot of fun. 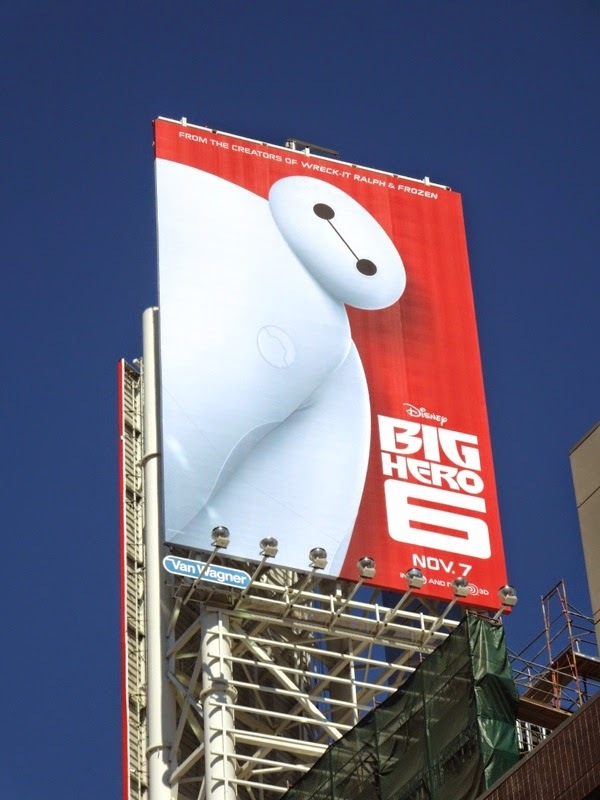 This striking Big Hero 6 movie billboard was snapped over Santa Monica Boulevard near Westwood Boulevard on October 16, 2014. 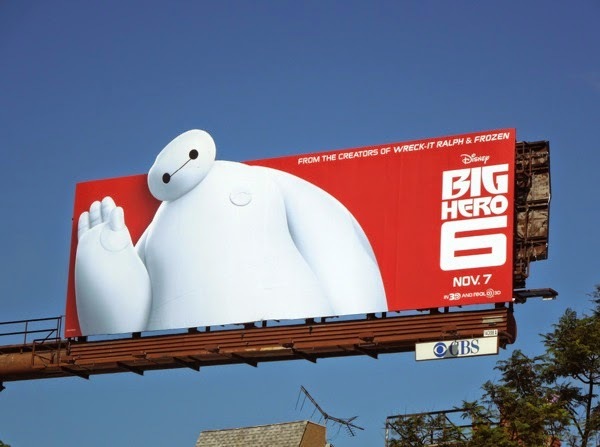 Plus here's another smaller billboard featuring the lovable nursemaid robot, spotted along San Vicente Boulevard on October 29, 2014. 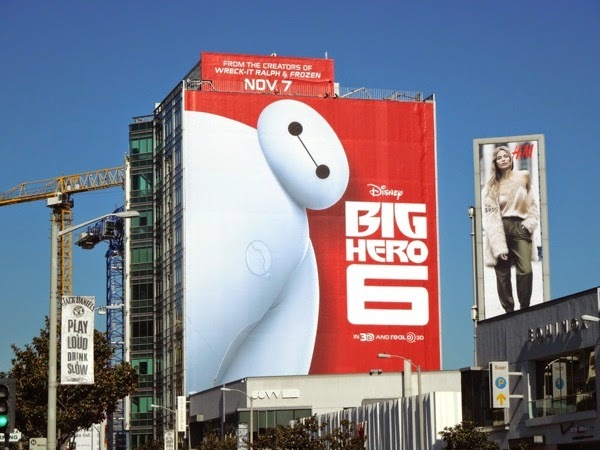 UPDATED: Big Hero 6 may not have enjoyed the 'Frozen factor', but it was successful and well received nonetheless and grossed $505 million at the box office worldwide. 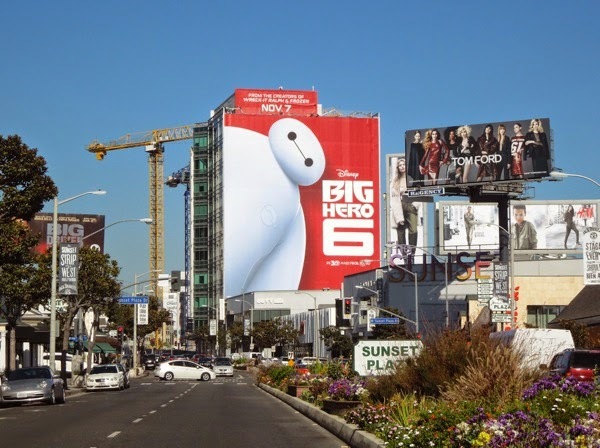 The adorable inflatable Baymax obviously played a big part in winning a place in audience's hearts and so he takes centre stage in this Oscar nominee billboard for Best Animated Feature, snapped along Barham Boulevard on February 7, 2015. 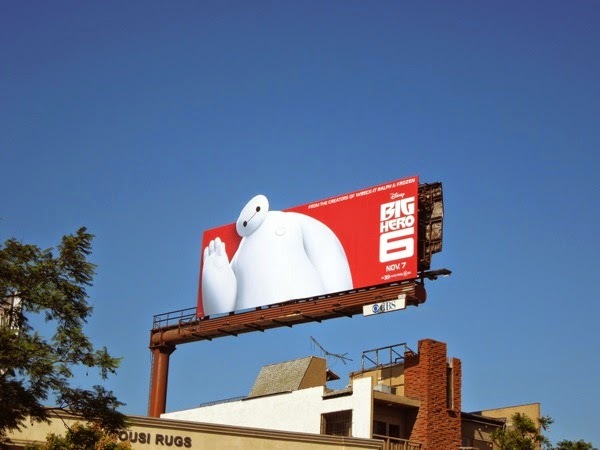 Be sure to check out his rivals and the other 2015 Oscar nominee billboards currently battling it out in the skies of L.A.